We usually have to wait a while for colouring books by Asian artists to make it into English language editions. These two books by Japanese artist, Tomoko Tashiro were first published in 2105 and now we have them in English. Who will love it - those who enjoy colouring whimsical style drawings, and those are captivated by fantasy images. You may enjoy reading about another Fairies book by Marcos Chin - here. Fairy tales, princesses and fairies seem to be universally loved as inspiration for colouring books. 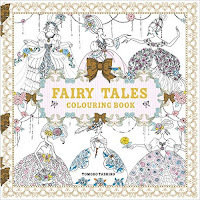 The images in these books are really breath-taking in their beauty, delicacy and detail. I'm quite charmed by them. The drawing is really pretty and delicate in these books.Often the details are fine and yet there are other pages with lots of white space for you to add your own touch. Most of the images are over double page spreads and there are many wallpaper spreads too. 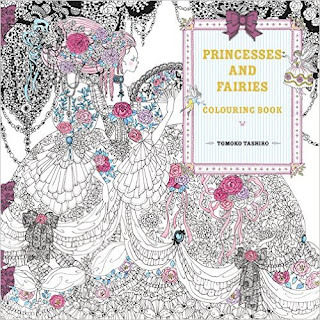 Princesses - there are general pages and others named after particular princesses in the stories - Thumbelina, the Frog Prince, Sleeping Beauty, Snow White, Midsummer Night's Dream, the Real Princess, Cinderella, Princess Minon-minette, the Fairies, the Little Mermaid, the Flying Trunk,, the Moon Princess, Tanabata. Fairy Tales - Little Red Riding Hood, Hansel & Gretel, Snow White, Sleeping Beauty, Rapunzel, Swan Lake, Twelve Dancing Princesses, Cinderella, Story of the Magic Horse, the Little Mermaid, the Snow Queen, and The Nutcracker. The books go in the sequence mentioned above with a couple of spreads from each tale along with a couple of wallpaper spreads on a related subject. For example, Cinderella has a wallpaper of shoes. The paper is white and the usual quality. You will need to test out your pens on an unobtrusive page first and always protect the following image by placing a sheet of card or paper behind the image you are colouring. Delightfully, at the back of each book is a substantial note from the artist with biographical information and interesting stories about what inspired her to create these books. 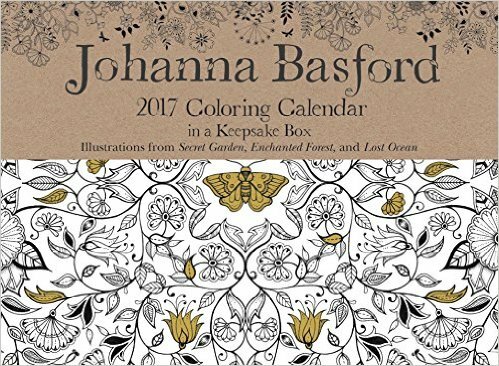 A Johanna Basford Year to Colour - here. 9 Must See New Books for December - here. * These books were sent to me by the publisher for an honest appraisal. Thanks.